RNIB has launched a pilot project utilising the help of volunteers in hospital eye clinics across the north of England to support patients recently diagnosed with sight conditions. Under the new Eye Clinic Support Service Volunteering Pilot which will run until September 2018, volunteers are being trained to support Eye Clinic Liaison Officers (ECLOs) in three hospitals in Greater Manchester and West Yorkshire. A total of eighteen volunteers across the three sites will be based in clinic waiting rooms in order to make patients aware of the ECLO service. The aim of the pilot is to help patients maintain their independence while adapting to living with sight loss. As well as helping to facilitate referrals into the ECLO service, volunteers will also provide basic information about other RNIB services. Sally Harvey, Chief Executive of RNIB, said: “We’re extremely excited to launch the Eye Clinic Support Service Volunteering Pilot across three eye clinics. 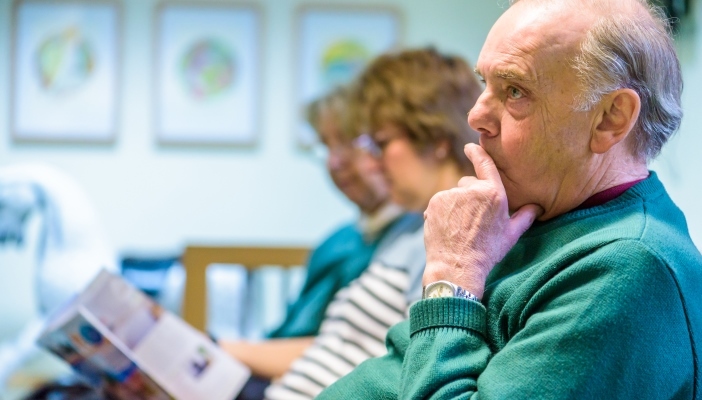 RNIB research has found that one in four newly diagnosed people leave hospital unsure of what condition they have, and are not told about the ECLO service. But a recent survey found that for patients who do receive support from an ECLO, 80 per cent reported having increased emotional wellbeing. RNIB will use feedback from the volunteer pilot to inform a roll-out of the scheme nationally in September 2018. For more information or to get involved, please contact the Group Volunteering Team on 01733 375450. A new project could help identify depression within people with significant sight loss during their first appointment with an Eye Clinic Liaison Officer (ECLO).